For five seasons, Roy Yamaguchi has explored the ingredients and growers of Hawaii on his public television show, Hawaii Cooks with Roy Yamaguchi. Now, in a companion volume to the sixth season, he brings his rich culinary discoveries to home kitchens. In Hawaii Cooks, Roy introduces a comprehensive pantry that describes his favorite ingredients in detail and carefully explains how flavors, textures, and colors play off and complement each other on the plate. 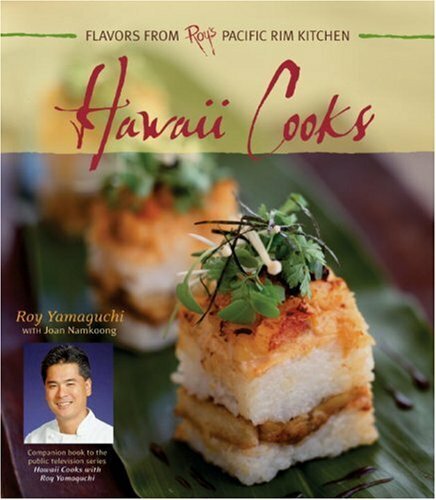 As a classically trained chef, Roy combines fresh, Hawaiian-grown ingredients with French cooking techniques to produce a mouthwatering collection of recipes with eastern and western influences. Recipes such as Crab and Taro Cakes with Béarnaise Sauce, Lamb Steaks with Sweet Potato Mash and Apple-Curry Sauce, and Crab with Vanilla Sauce pack an unexpected punch in every delicious bite, bringing out the flavors of ingredients in ways that only Roy can.